As I type this, I stand firmly on the waining end of National IPA Day (August 1st). With two different bottles of IPA rattling around in my bones, I blame all levels of grammatical inaccuracies and typos on higher than average ABV’s. IPA day was started by bloggers, with nothing to gain but promoting the hoptastic end of craft beer sepctructrum. It wasn’t a cooperate game, a marketing strategy, or a way to promote a single beer. It’s a rally cry, a voice from within this community I’ve come to love that just says, “join us.” A way to celebrate the beer that’s at the cornerstone of a movement that identifies us as a community and a way to pull others into the pot. Drink the Dry Hopped Kool-Aid with us, we want you here. No singular voice benefits from this, it’s just a fun, rising tide, that lifts all craft beer ships. For these reasons, I’ll always participate. Until it gains sponsors, then I may have to reconsider. As I spent a day in and out of comprehensive distraction, I did what I do in this corner of Craft Beer Land, I cooked. I baked. I made a cake that served as a bit of therapy for a strange time in a strange life. I wanted to pay homage to the Beer of the Hour, but that IPA can temperamental. Cooking and reducing an IPA in any capacity can be a bit hit or miss. Higher IBU beer (IBU stands from International Bitterness Units, it’s how to tell how hoppy or bitter a beer is), reduce to a very bitter product. 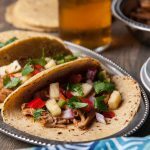 I generally use them when the beer won’t beer cooked (or at least not cooked for an extended period of time), or when I want a little beer to go along way, flavor wise. A fringe benefit of beer blogging is surprise shipments of beer from great breweries. A recent shipment was graciously sent over from a brewery out of Athens, Georgia called Terrapin. Although most of the time I’ve spent in Georgia should go lavishly unrecorded, I would like to take a trip back to visit this place. Terrpain’s dedication to diversity of brew, as well as a steadfast determination to provide Beer For All, makes this a place I want to hang out. Sampling the beer sent all the way to the far reaches of the West Coast, I found beer that I can give to the Craft Beer Seekers in my life as well as beer that I consider to be Gateway Beer. Gateway beer is a favorite category of mine, and often hard to fill. It’s beer that will rest well on the palates of those in the Craft Beer know, as well as easy beer to serve to people who, “don’t really like beer.” It’s my way of pulling a few vodka drinkers and inBev devotees over to the Craft Beer side. Only hours after a stash from Terrapin landed on my doorstep, I weighed my options. For this cake, I needed a lower hop beer for the cake and wanted an IPA for the filling and the frosting. I choose Maggie’s Peach Farmhouse ale (great gateway beer) for the cake and Hopzilla (beautiful, well balanced IPA) for the frosting. 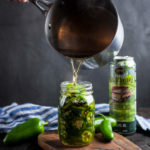 If you’re new to craft beer, or want a beer that’s easy to serve to people on the beer fringes, the Maggie’s Farmhouse is a great one to offer. It would also be a great choice for my Beer Sangria. 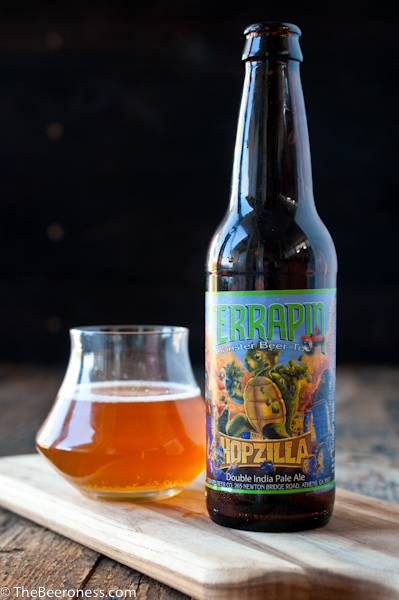 The Hopzilla I really liked, it was well balanced and in my world of flavor profiles and balanced tastes, that’s a win. A nice malt finish after a hoppy start always wins me over. In a large bowl, stir together the cake flour, baking powder, and salt. In the bowl of a stand mixer add the butter, sugar, and lemon zest, beat on high until very well combined, light and fluffy, about 5 minutes. In a small bowl, add the beer and buttermilk (it’s ok if it curdles). Alternating between the flour and the beer mixture, add a bit of each to the stand mixer while it runs on low speed, until all ingredients are combined. Scrape the bottom of the bowl to make sure all ingredients are well combined. Remove the batter, add to a large bowl. Clean the mixer very well (using a hand mixer or a separate mixer is fine as well). Add the egg whites and cream of tartar to the clean bowl of a stand mixer, any amount of fat and the egg whites will not whip properly. Whip on high until stiff peaks form, about 5 minutes. Add about 1/3 of the egg whites to the cake batter mixture, gently fold to combine. Once combined, gently fold in half of the remaining egg whites, then the final egg whites, stir until combined. Grease and flour three 9-inch cake pans very well (8 inch cake pans will work as well), divide the batter between the three pans. Bake at 350 for 20 minutes or until the tops have just started to brown. Allow to cool to room temperature before removing from pans. While the cake is baking, make the curd. In a pan off heat, whisk together the eggs, yolks, sugar, lemon juice, lemon zest, beer, and corn starch. Add the butter cubes, place the pan over medium high heat. Whisk frequently until thicken to a pudding like consistency, about 10 minutes. Remove from heat, add to a bowl and refrigerate until chilled, about 1 hour. To make the butter cream, add the butter, sugar, and zest to a stand mixer, building up speed, beat on high until very well combined, light and fluffy, about 5 minutes. One tablespoon at a time, slowly add the lemon juice, beer and milk, allowing to re-mix to a fluff consistency between additions, this should take no less than 8 minutes total. Make sure the frosting is very well whipped. 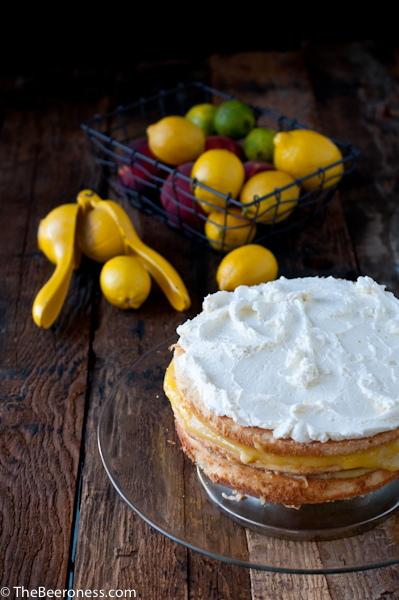 To assemble the cake, add one layer of cake to a cake plate. Top with half of the lemon mixture, then with another layer and then with the rest of the lemon mixture before adding the final layer of cake. Top the final layer of cake with the butter cream. If you want to frost the entire cake with buttercream, double the buttercream recipe, assemble the layers and chill the cake for at least one hour before attempting to frost. This looks fantastic! 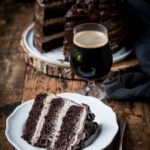 My birthday and IPA day coincided this year and since it was a busy day we haven’t celebrated with a birthday cake yet…I think I’ve found the one I’ll make! 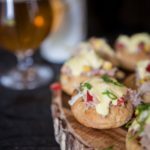 I knew you would have up an awesome post sometime soon about IPA day! And Awesome this is! What a gorgeous cake and gorgeous photos! I always leave your sites wanting whatever you posted!! It was one of those, “I know I need to let this chill before I shoot it but I’m too impatient and I want to do it now” kind of things. Later that evening, when I had more, the filling was set and looked better, but I sort of like the look of messy food! I’m usually not too keen on Terrapin since I’m not a bitter beer fan, but I love Maggie’s Farmhouse. It’s been on of my favs for this summer. I love how you featured Terrapin!! I’m from Atlanta and went to UGA for school, so it’s close to my heart, and the first brewery I ever went to! How could I have not known about IPA day?! I’ll be making up for it verrrry soon. This cake is truly dreamy, Jackie! 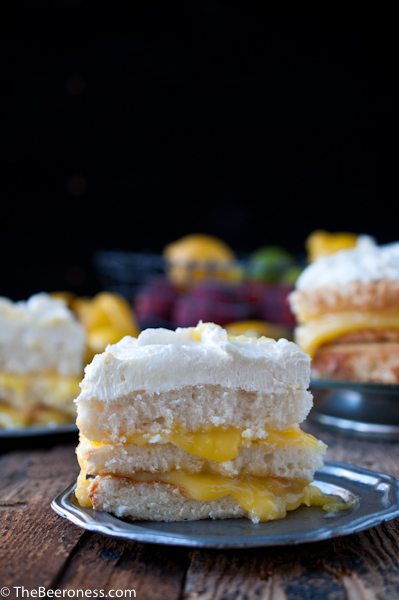 What a gorgeous lemon dessert. Your creativity never ceases to amaze me! 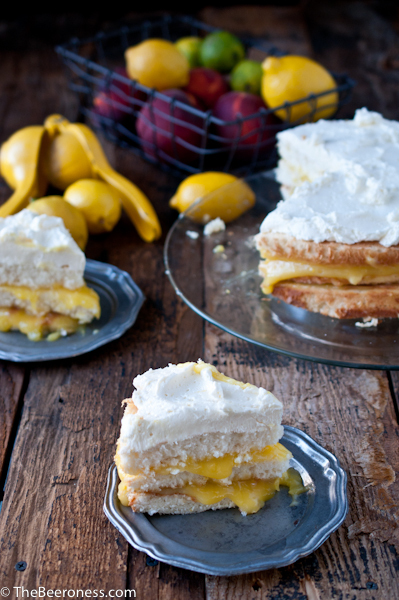 I love all lemon desserts. I love beer- I cannot wait to try this. I’m newt our site, just subscribed! 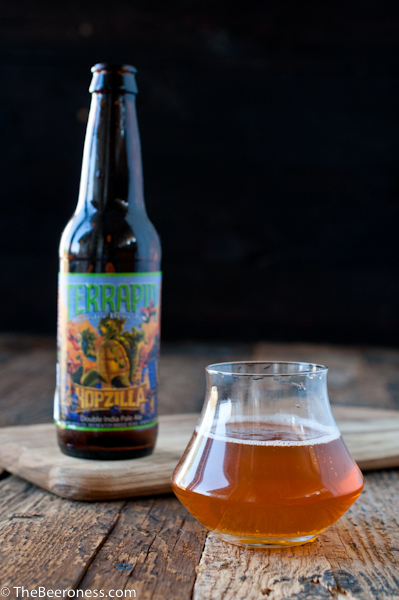 We live in Atlanta, my husband is from southern CA, Terrapin is his ‘go to’ beer. Now, you need to try Hopsecutioner and Big Hoppy Monster, promise, your opinion of GA might be slightly changed :). Love seeing our local beers! Not sure how I missed national IPA day. It’s my favorite kind of beer and we live in beer country (hood river, OR) This looks delicious! 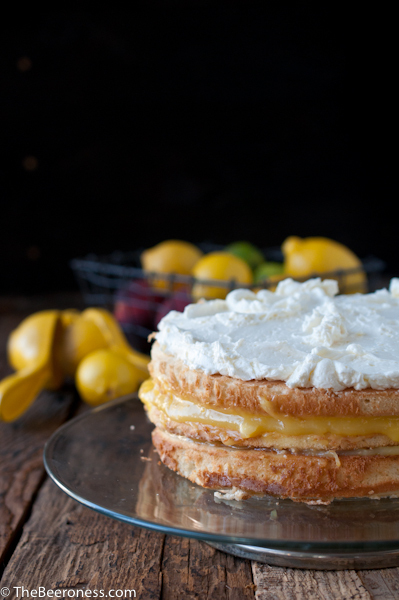 *Love* this cake – lemon and beer are practically my summer staples. Sometimes when I’m supposed to write a blog post, my mind is completely blank. A cold, local, brew always kicks the wallflower in me to the curb. seems stunning! -as everything in this website-so i am about to make it. won’t the curd smell / taste of egg wiith 5 yolks and 2 eggs. i am a bit afraid. No, thats a pretty standard curd recipe, just added beer. The eggs are primarily used as a thickener. The lemon and beer come through much stronger than the eggs ever could. that you take the time to reply every question of ours. Looks fantastic! Thanks for sharing this recipe. I am eager to try this dream cake. I just finished making all of the components! Can’t wait to put it together! I’m making it for my brother’s 31st birthday. We are lovers all all forms of Sierra Nevada beers. I used a Harvest Wild Hop IPA and Olivia Abbey Saison. The curd and frosting are super delicious. Thanks for sharing the recipe! My partner is an avid brewer and fellow beer nerd, so I knew I wanted to do something special for him for his birthday next week. We’re both a bit crazy when it comes to our experimenting – him with his brewing, and me in the kitchen. We love the philosophy of making the most of every component, and for that reason I wanted to see how many different elements I could take from a beer and make it into something special. For my birthday in February, he introduced me to my now favourite beer: Liberty Brewing Citra Double IPA (we’re in little ol’ NZ!) so I wanted to use that as the basis for my cake. I’ve taken a few creative liberties with this recipe and tweaked in the hopes of creating something super special… Yuzu lemons for the curd, DIY buttermilk by curdling with grapefruit juice and then the part that’s going to require a fair amount of trial and error – a buttercream made with ‘hop butter’ – using hemp butter recipes as my basis for experimentation. Pretty excited to see where it leads, and hopefully it turns out as planned! Thank you so much for such a beautiful blog. It has been the source of much inspiration for both my partner and I, and really helped us bond even further.